$45, includes breakfast, lunch, and resource notebook. Please save the date for our 2014 conference: November 1, 2014! This year’s Farm to School Conference will offer multiple workshop sessions geared specifically for teachers, early childhood educators, professors, education and nutrition students, parents, and child nutrition staff. Participants are encouraged to invite key stakeholders in their school or community to join them at this training, creating “teams” that can support and sustain Farm to School efforts. 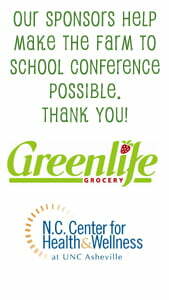 Join educators from across the southeast to strengthen existing programs and jump start new Farm to School efforts in your community! Connecting the youngest students with local food and farms. Integrating Farm to School into coursework, service learning, and more. Discover how Farm to School can work for you. Learn more about specialized Farm to School topics. $35 includes resource notebook, local food breakfast, and lunch. All k-12 attendees will receive certificates of completion for CEU purposes. 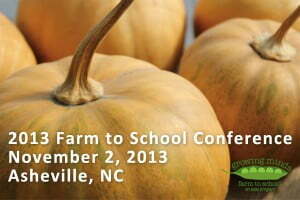 Are you attending the Farm to School Conference and are interested in rebuilding the food system in rural WNC? Plan to come a day early and attend our Local Food in Rural WNC Forum held at the Sherrill Center the day before the Farm to School Conference.